Uppsala, Sweden / Nuremberg, Germany—February 11, 2014—Offering technical seminars during embedded world has almost become a tradition for IAR Systems®, the world’s leading supplier of software tools for developing embedded applications. 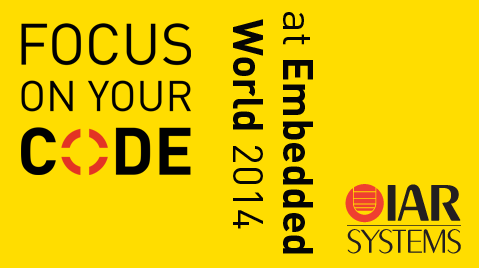 At embedded world 2014, IAR Systems puts full emphasis on the developers’ needs: Within the framework of Focus on Your Code, the company offers a non-stop series of free technical seminars directly at its stand 4-216. From Tuesday February 25 until Thursday February 27, the company’s experts will provide in-depth knowhow “on the go” in seminar sessions of 20 minutes each. The seminar schedule will be the same on all three days and includes presentations on “Debugging Code in a Multicore Environment” and “Debugging Code in an RTOS-based Application”, “Taking Code Trace to the Next Level”, “Writing Safe Code”, “Writing Compiler-Friendly Code”, “Code Error Checking During Runtime” and “Correlating Code to Power Consumption”. Visitors of embedded world may join the free seminars anytime in the presentation area of IAR Systems’ stand 4-216. With Focus on Your Code, IAR Systems shows its strong support for developers so they can fully focus on their code. As a long standing player in the embedded tools market, IAR Systems provides the powerful and easy-to-use development toolchain IAR Embedded Workbench with support for more than 8,000 microcontrollers. The tools come with thousands of example projects, step-by-step tutorials and a user-friendly IDE which offers developers all they need for a quick start. A wide ecosystem of integrated RTOSes, middleware solutions, and other tools help to accelerate the development process. On top, IAR Systems’ comprehensive documentation and technical training, as well as the world-wide available extensive technical support pave the way for successful embedded development projects. The full schedule of IAR Systems’ non-stop series of free technical seminars at embedded world 2014, stand 4-216, is available at www.iar.com/eworldseminars. Editor's Note: IAR Systems, IAR Embedded Workbench, C-SPY, visualSTATE, Focus on Your Code, IAR KickStart Kit, IAR Experiment!, I-jet, I-scope, IAR Academy, IAR, and the logotype of IAR Systems are trademarks or registered trademarks owned by IAR Systems AB. All other products names are trademarks of their respective owners.